When you think dirt racing, you think small town short tracks. Thats exactly what PA dirt racing is. And it is some of the most exciting and exhilarating racing East of the Mississippi River! Port Royal is no exception, home to the Port Royal Speedway! Located at the Fairgrounds, this semi banked 1/2 mile dirt oval host series like World of Outlaws and the Arctic Cat All Stars. 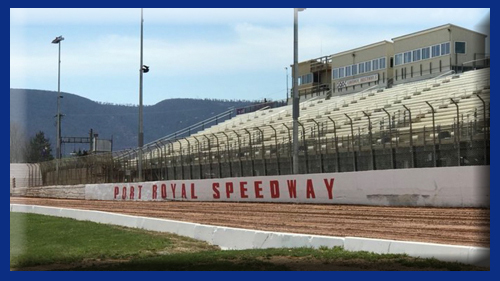 With grandstands that can seat 6,000+ and parking in the infield, you are sure to get a ticket for some great weekend racing. This week on Track Time, Steve O’Neal, Promoter for Port Royal Speedway, joined us on the Barbasol Shave Phone Line. Steve gives us a glimpse into some of Port Royal’s unique history as well as what to expect for 2018. Rich in history dating back to the late 1800’s as a horse track, Port Royal Speedway shared horse racing up till the mid 2000’s. Port Royal Speedway is located between I-80 and I-76 on State Rt 22 between State College and Harrisburg. May 27 is their annual Bob Weikert Memorial Weekend, so be sure to circle the date!! !